Improve hand flexibility and combat fatigue with this adjustable hand exerciser. Fretting your way through "Bohemian Rhapsody?" Trying to tackle a Rachmaninoff sonata? Whether you're a guitar player, keyboardist, or computer keyboard artist, you could be contending with pain and stiffness in your hands that hampers your best performance. 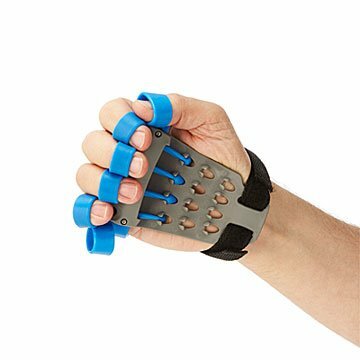 This reverse-grip hand exerciser is designed to compensate for the many gripping motions we do naturally every day. Strap it on to either hand (fits most), attach the individual tension bands to each finger and thumb, and you're ready for repetitive stretching that can help alleviate carpal tunnel and tendonitis symptoms and improve flexibility in your fingers. The design also features adjustable anchors for each band so you can customize the resistance for each finger. Plus, you'll look like a cyborg superhero in the process (sorry, web-shooting function not included). Made in New York. Wash With Warm Water. Gently pat dry. I am reviewing this product in the hopes of getting the advertised $1000 gift card. That said it was a good gift for my mother in law who plays guitar. She thought it was neat. Bought this for my punk musician boyfriend, after his initial comment of "this looks like highway robbery" and some persisting he try it out, he actually finds the resistance great exercise. I could see how this is also a great tool for someone recovering hand mobility. Would recommend to all musician's girlfriend's who have run out of musically-relevant gift ideas. I haven't used it much, but on the day my dad opened the gift we all used it and I loved how it could fit on all of our different hand sizes. Just tighten the straps, put your fingers in the little holes and you go exercise your hand. It's awesome and fun!